Strip malls. They’re everywhere, and not just in St. John’s. Every town, city and borough in North America seems to have them, sometimes by the dozens – the equivalent of a severe, creeping, grotesque case of acne. The best you can hope for is a mild outbreak. Moderate to severe is more likely. St. John’s is developing a severe case. But, before anyone calls for tetracycline to achieve an equable complexion, let me say this; lately, strip malls have become something of a haven for small, independently operated restaurants. I’d love to see them flourish, because, although they may not be comparable to some of the larger, trendy downtown restaurants – where they serve charcuterie and other food on slabs of tree trunk – these little “I think I can, I think I can” places do serve very good food. Fall River Plaza on Torbay Road is a particularly outstanding bit of strip mall edema. Over the years it’s grown into a series of structures and encouraged other construction, of different sizes and shapes, to share its patch. Infiltrating the gaps is a web of parking spaces – filled with cars, trucks, SUVs and vans – sometimes calm, often roiling. 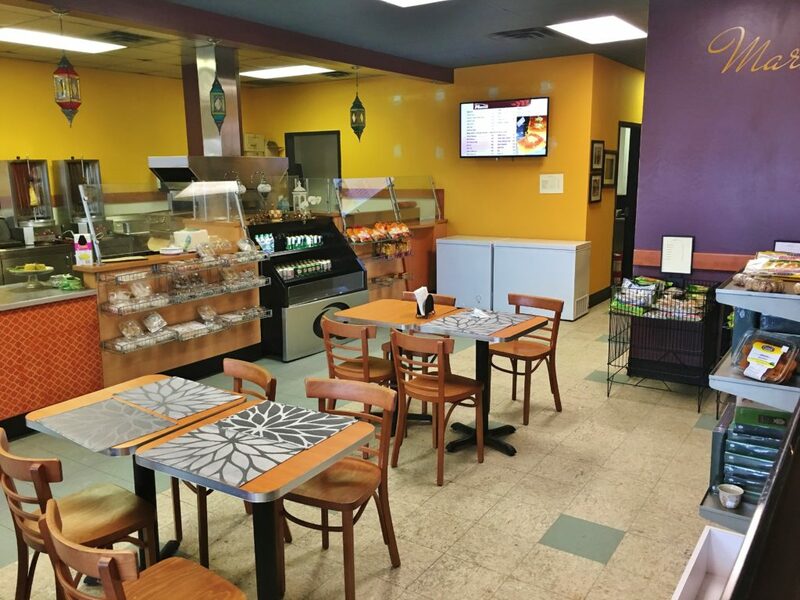 Included in the current menagerie of plaza businesses is Sumac Middle Eastern Market and Eatery. 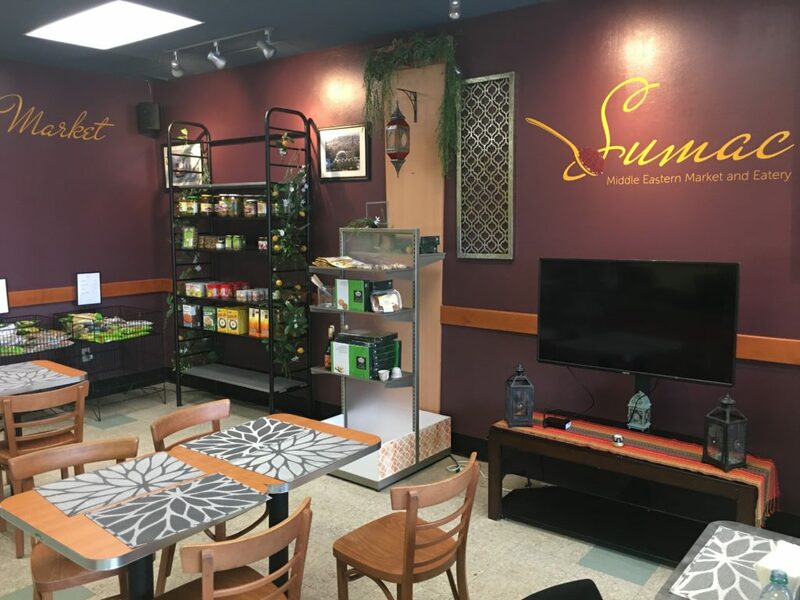 Sumac – the business, not the bush – is supposedly a restaurant and purveyor of grocery items, but its claim on the term “market” is rather tenuous. Yes, there are a few bins of pulses, a couple of shelves of bottled condiments, tinned items – such as stuffed cabbage, artichokes and chick peas – and dry spices. 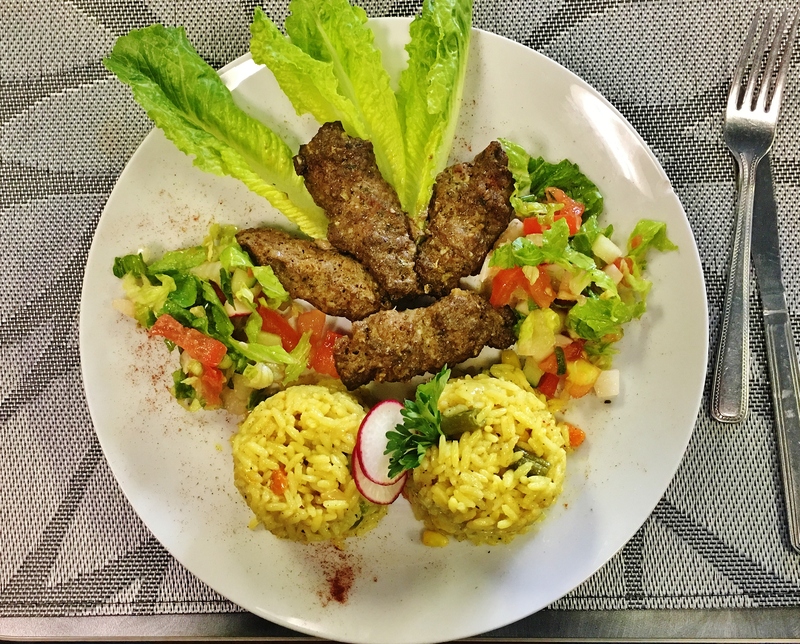 Mostly, however, Sumac sells freshly prepared food items – to take out or eat in – and a counter selection of baked goods and sweet treats. Behind the counter, where orders are taken, was a genial, brawny fellow with the physique of someone who looks to be into a bit of body building. I later discovered that Tarek Jaml owns Sumac. Sumac’s website says Jaml was born and raised in Syria. He lived in the UAE for 15 years before emigrating to Canada. Since moving here he has had it in mind to open a business to make the dishes of the Middle East available to St. John’s residents. Sumac opened its doors six months ago. 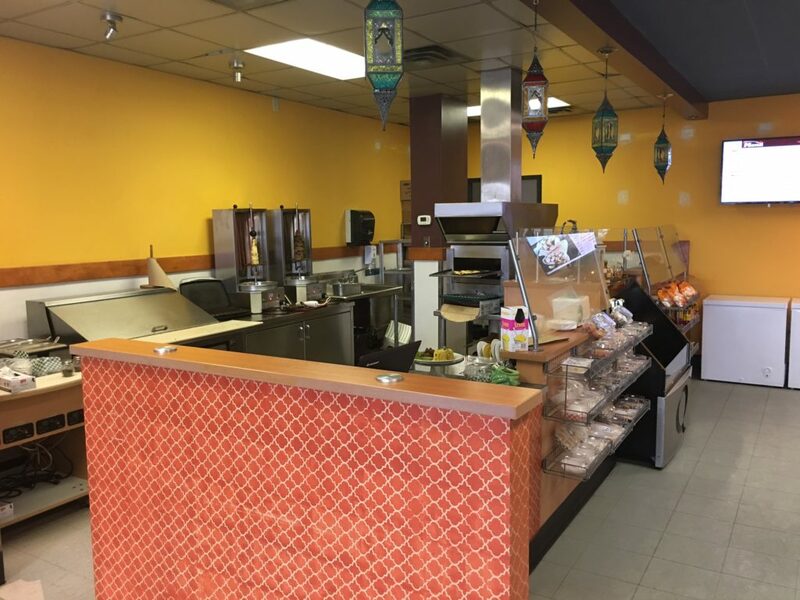 Behind Tarek Jaml was a well-equipped, open, stainless kitchen with two shawarma machines taking centre-stage. These vertical radiators are the pistons that make Sumac’s engine run. Shawarma, either chicken or beef, is the core of Sumac’s modest menu. In addition to sandwiches and plates, there’s even shawarma poutine – which makes perfect sense when you think about it. 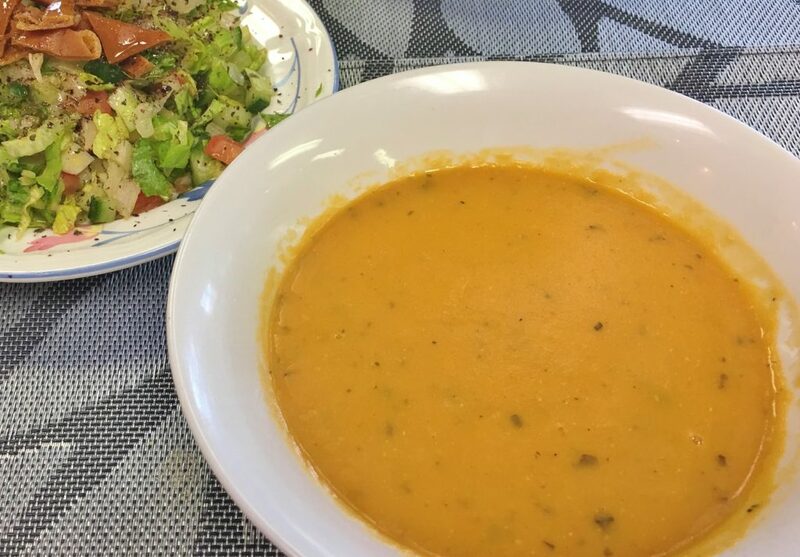 Lunch began with Sumac’s lentil soup. It was silken, and had the familiar golden hue of cooked red lentils. I liked the faint taste of mint, a nice surprise since the bright, sunshine colour of the soup had set me up for perhaps a hit of citrus. Speaking of citrus, there was plenty in the lemony fattoush salad. 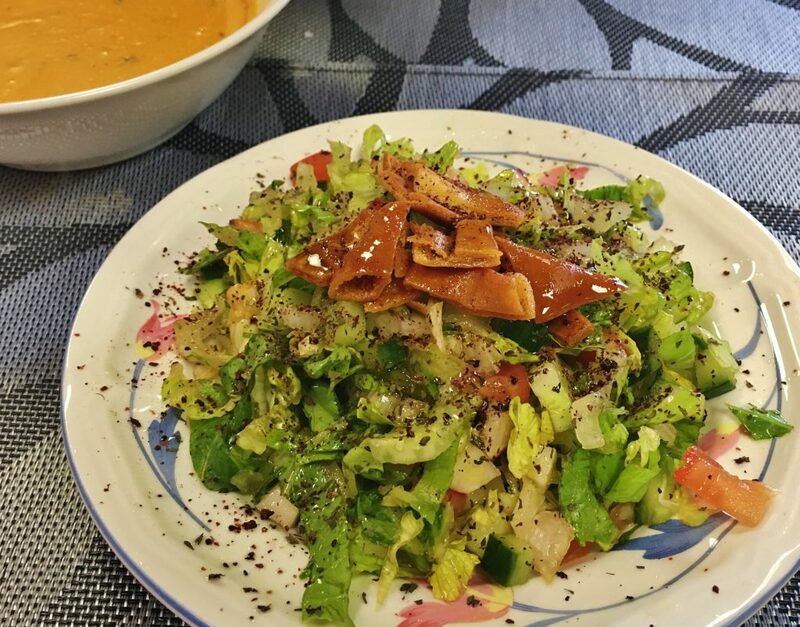 Like a light snow flurry on grass, the mixture of romaine, cucumber and tomato was also covered with flecks of sumac – the ground berries of the sumac bush, from which Sumac gets its name. This was a light and refreshing salad. Unlike the spritz of fresh lemon, it certainly didn’t need the hardened, unpalatable bits of fried pita on top. Thankfully, pita that had been nowhere near a deep fryer was served with the hummus, another commendable treat. It too was silken. Served with a pour of olive oil on top, it made an unctuous spread for my piece of freshly torn pita. 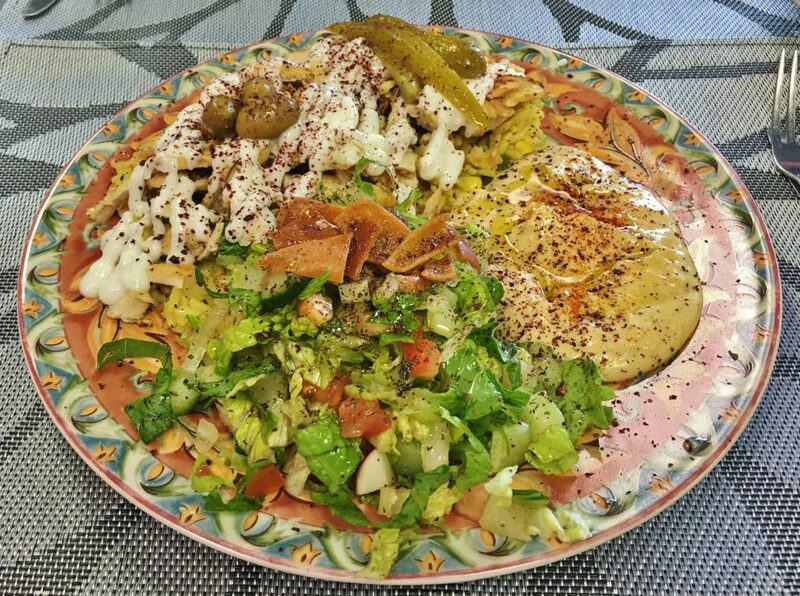 Sumac’s shawarma chicken plate came with more of the fattoush salad. There’s nothing better than rich, garlicky chicken. In this case, the shawarma chicken, with rice underneath, was served smothered in a dairy based, white garlic sauce. Tarek Jaml was teeing-up the day’s special for every new customer. It was beef kebab. What the hell, I thought, I’ll go for that. Jaml brought me a small dish of homemade hot sauce to go with the beef. I’m glad he did. Although the beef was perfectly cooked, it needed some zing. A creamy rice, possibly coloured with turmeric, that felt heavenly in my mouth, could not have been better. I wanted to put a big, fat bow on this very good meal by concluding with one of Sumac’s fresh desserts. The menu advertised two: kunafa – a sugary confection featuring vermicelli, and honey drenched baklava. 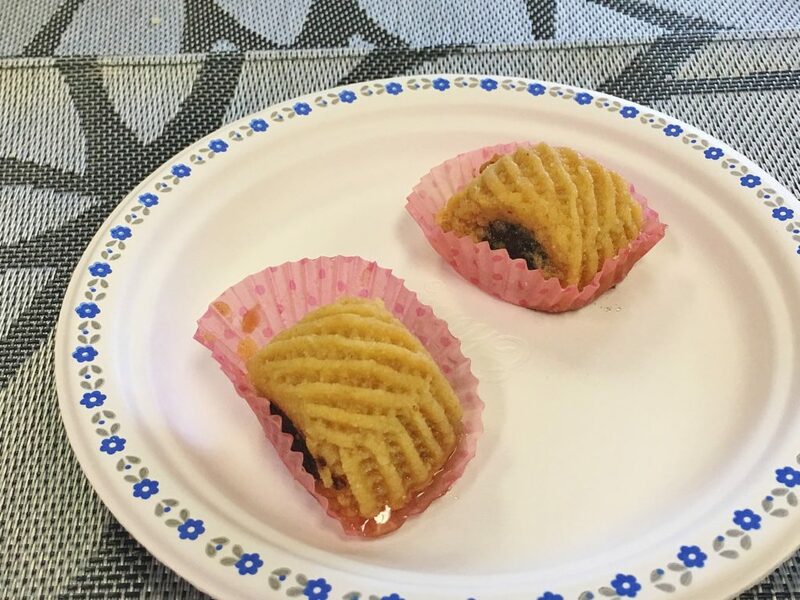 Jaml informed me that the kunafa wasn’t ready, but that the baklava was available. I ordered the baklava. When dessert time rolled around, a server arrived with something else. Apparently, the baklava wasn’t ready either. I would have to make do with two pieces of pastry stuffed with a paste made from dates. Sure, I thought, why not. I ate one piece and left the other on the plate. Sumac’s pastry substitute was simply awful. The most charitable words with which to describe it are mealy, and stale. Not the best ending. Still, overall, I liked Sumac a lot and recommend you try it. Price Lunch for two with appetizers, tax and 18 percent tip costs approximately $45. Open Sunday from 12 p.m. to 5 p.m. Monday through Saturday from 10 a.m. to 10 p.m. Parking Fall River Plaza has a large parking lot. Beverages Bottled water and a selection of soft drinks. Wheelchair access Assistance required at entrance. Otherwise, fully accessible.